For those not familiar with this archaic term, tavern stands were houses, taverns or inns of first class, no one driving livestock would dare stop there, but instead, go to a waggon-yard. Unlike a modern tavern of today these places were often meeting houses used for many purposes such as school houses, town hall meetings, court rooms, and even churches. Being halfway between Lexington and Versailles, Thomas S. Graves purchased the land from George Keen in 1834. Family tradition says the labor was provided by slaves from the farms of Nelson Graves as a wedding gift to his sister Mary Emma Graves and new brother in law Thomas S. Graves. Soon after the construction a question arose as what to call the place. An 1881 newspaper article in the Woodford Sun gives the following account "One very cold icy day, the following winter, a few of the passengers on one of the stages decided to leave their seat and head down the hill. As they passed a rocky place a frightened rabbit ran down the pike. About a half dozen passengers gave chase. The rabbit was to swift and easily outrun his pursuers quickly vanishing from site. The tired travelers made the trek back up the hill to the warm cozy tavern. As they entered the other passengers who witnessed the chase asked where the hare had gone? An old Irisman said "Faith and he just slicked away from ye, for ye could not cover the ice as fast as he." It was decided the name would be Slickaway. In another account, Thomas Streshly is said to have given 3 of his freed slaves land in the vicinity of John Parker’s gristmill in 1826, on which they established a settlement called Reform. A Post Office and Castleman’s General Store was in operation from 1854 to 1857 with Charles W. Castleman, Post Master. (Another variant refers to the freed slaves of a Joshua Worley who were located on this land soon after Parker’s mill was built in 1794.) To this site, in antebellum times, slaves would slip away for night-time gatherings and it thus came to be called Slipaway and eventually Slickaway. According to a less accepted account, the place was first called Slipperyway (corrupted to Slipaway and later to Slickaway) after a horse lost its footing on the icy road and fell into the South Fork of Elkhorn Creek, killing its rider. Neither account has ever been authenticated. But the Post Office of Slickaway was officially established there in March 1872, with Levi Rice, Post Master. In 1886, the Rev. Rutherford Douglas, embarrassed by this name, and having his mail addressed to Slickaway, had it changed to Fort Springs. After much research and the time consuming task of connecting each title the site has been accepted on the National Historic Register. 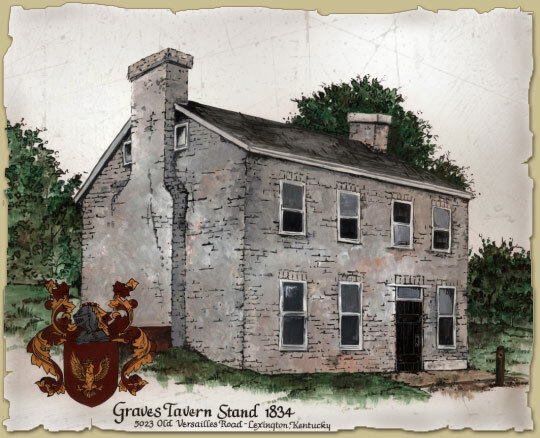 The original records refer to "Graves Tavern Stand", an old dry stone tavern, built in 1834, by Thomas S. Graves. It was built over a large spring, which was used as a fort or headquarters for Union troops during the Civil War. There are remnants of an antebellum cemetery in the back yard. The Graves Family sold the Tavern to John Valentine in December of 1847 and it became known as the famous Valentine’s Tavern. The post office closed in 1903. Locals still refer to it as Fort Springs, and even occasionally Slickaway.